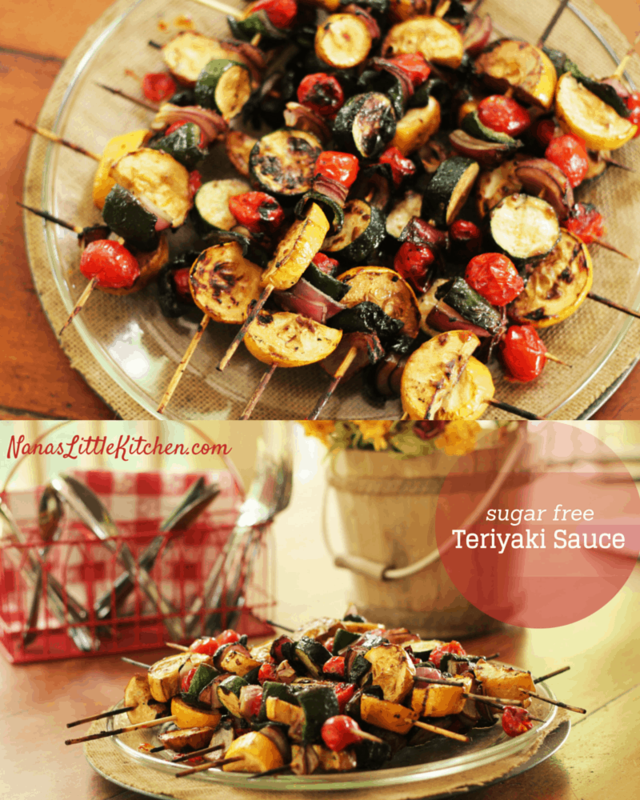 Grilled Teriyaki Kabobs with garlic and ginger and naturally brewed soy sauce, OH MY! This recipe for teriyaki sauce makes a fantastic marinade for boneless, skinless chicken or cheaper cuts of red meat. I even marinate beef tips in it for kabobs and it comes out very flavorful and tender. 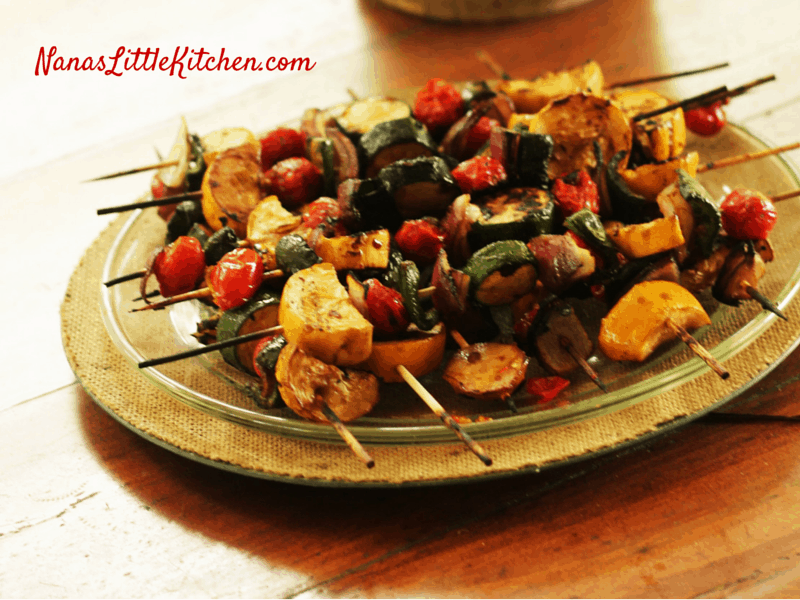 Of course, it is fantastic for steak kabobs too, but it compliments many cuts of meat that you might not normally consider grill worthy. The smell of this stuff just makes me want to drink it yum! I cut back on the oil to lighten it up a bit and used a lot less molasses to keep it low carb and low glycemic. I got this basic recipe from the Better Homes and Garden Cookbook that I received when I graduated from high school and we have loved it all these years! I tweaked it a couple of years ago and made it THM/Low Carb friendly and I’m moving it over from my old blog now. *See full directions in print box below! This is a pretty strong, fast acting marinade so I usually marinate the meat for 4 hours max. This batch will season roughly 2 pounds of boneless skinless chicken breasts or 2 pounds of beef kabobs with some left over for the veggies. I just pour the marinade from the meat over the veggies prior to cooking and brush on when they go on the grill before cooking. If you save out some marinade before soaking the meat you can continue to brush it on the meat and veggies until they are done, but it has a good flavor either way and the marinade makes the meat tender and more succulent than just dry seasoned/grilling. Cook up a big batch because the meat and veggies reheat very well the next day. I thread the beef tips on the skewers but sometimes cook the chicken breasts in whole pieces. This is easier to prepare and give more versatility when reheating. other relatively inexpensive cuts of meat for kabobs but this sauce is also incredible on a good cut of steak! 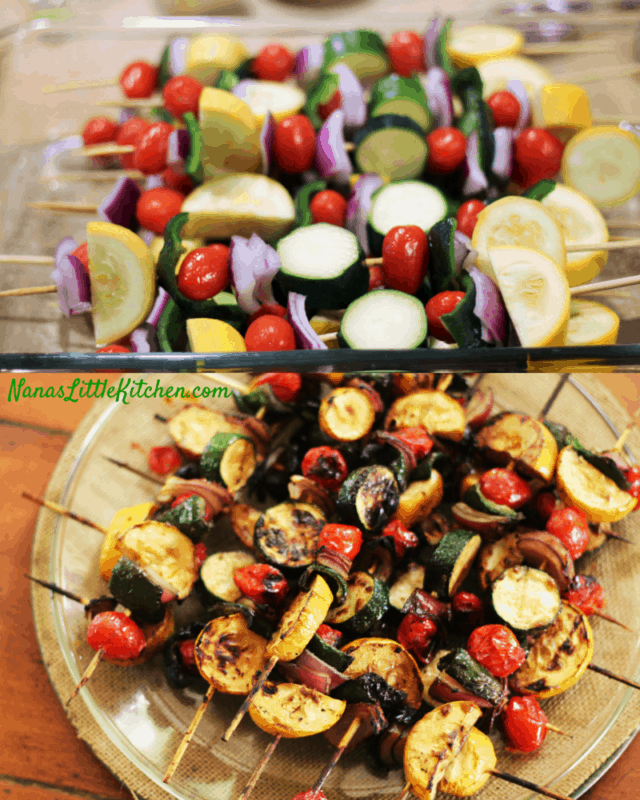 Approximately 12 wooden skewers soaked in water for at least a few minutes to make them grill ready. Mix together the sauce and place in a jar with a tight fitting lid until ready to use or pour over meat and marinate right away. Select the meat and rinse and shake it dry then place it in a plastic baggie and cover it with the marinade. I like to marinade this for 2-4 hours. 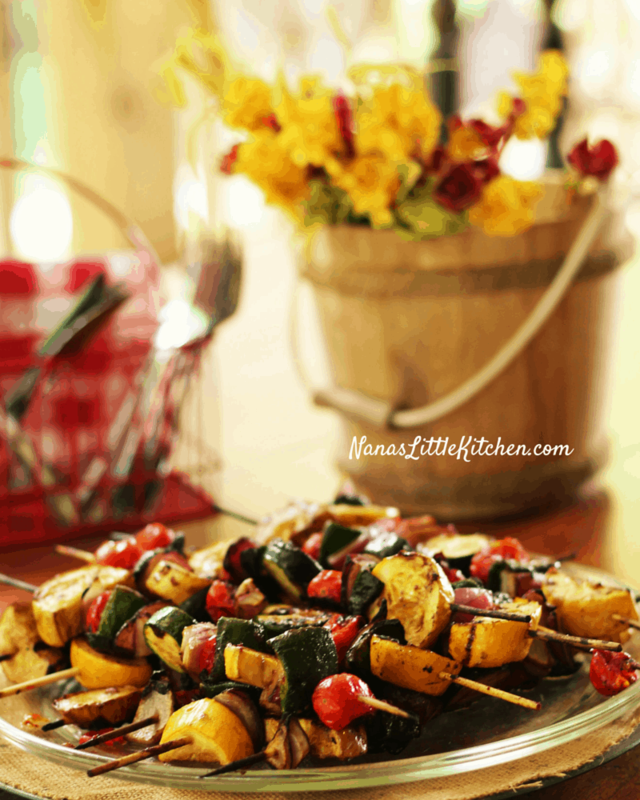 Remove from the bag and use the excess marinade to pour over and/or brush thoroughly onto the skewered veggies. 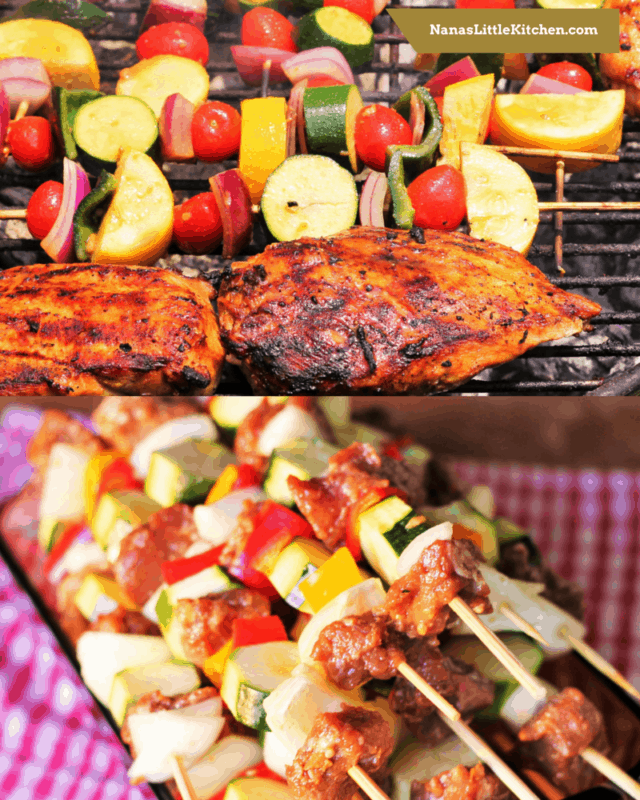 Either slice the meat and thread it onto the skewers alternating with the veggies then grill or in the case of whole pieces of meat, like the chicken, you might skewer the veggies only and grill the meat first then add the veggies to the grill a little later as they will not take as long to cook. I loved this recipe! I used the Braggs Soy Sauce instead of the Tamari, so good! The only thing I noticed is that it was a little salty for me. My family didn’t feel that way so it may be just me. I used Chicken and it was so tender, amazing! 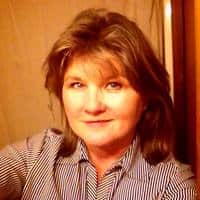 Thank you for sharing your recipes, they are my favorites!